When I asked Norman what got him started in water gardening his answer was; "It was me tadpoles you see, I started with them and never looked back" As a young boy Norman kept aquatic flora and fauna in a child's wading pool. When he grew up he became a teacher, teaching Gardening in a state school. In 1956 Norman, and his wife Pam, began growing water lilies on a 10 acre site that was originally a quarry where clay was dug to make bricks. 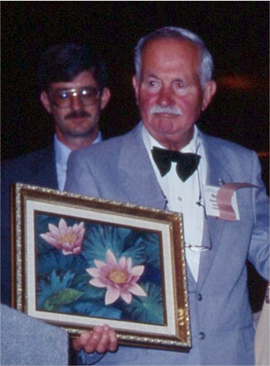 Much of Norman's original water lily collection came from Marliacs. Norman Bennett made a pilgrimage to Marliac's in 1975 where he established a relationship with the Laydekers. He wrote one of the first articles about Marliac in The Water Garden Journal. Through his correspondence with Laydeker Brothers the Society was made aware that the Nursery was up for sale and enabled one of our members Mr. Ray Davies the opportunity to purchase it. Thanks in part to Norman Bennett's efforts, Le Establissement Botanique Marliac will be preserved for the use and study of water gardening. 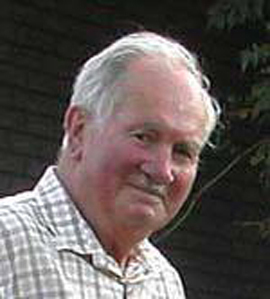 Norman is responsible for our German connection, his contact and involvement with Karl Wachter has stretched over the last 30 years. Thanks to Norman's commitment and hard work with Karl, we now have a very large and active German membership. Norman has helped established an expanding, progressive European group within the IWLS. More than anyone this "jolly good fellow" has brought together the internationál flavor of our Society.